(AP) BIRMINGHAM, England - Just a few years ago, sprinter Ryan Bailey was living out of a car with his mom, hanging out with gang members and failing in school. Not exactly the typical path a sprinter takes to the Olympics. The 23-year-old Bailey looks back at those days and shakes his head in wonder, hardly believing he's become an Olympian. This from a kid who once was stabbed three times on a city bus and once had to endure a severe beating just to escape gang life. This from a kid who slept in the front seat of a car, because they really had no other options, and was briefly booted out of school. "It just seems so unbelievable I'm here," said Bailey, who will compete in Monaco on Friday before arriving in Birmingham for training camp. "I sit back and think, 'Wow, I could be like a couple of my friends - in jail or dead. I could be right there with them. But I'm not." No, he turned that page of his life. 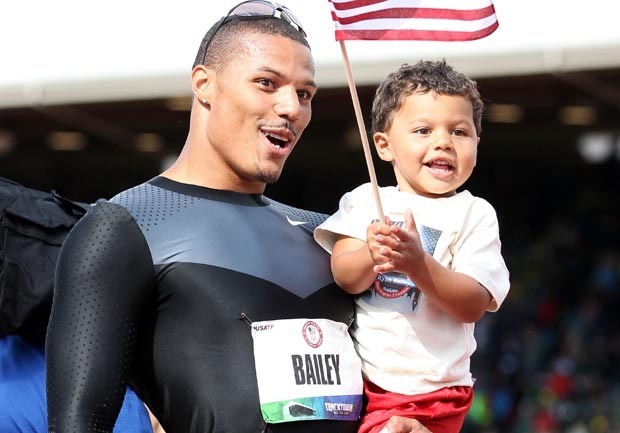 At the U.S. Olympic trials last month, very few knew of Bailey. He was simply the runner who finished third in the 100 meters, taking a back seat to Justin Gatlin and Tyson Gay. Those two had the more compelling stories, with Gatlin securing his return to the Olympics after a four-year doping suspension and Gay taking second on a surgically repaired hip. Turns out, Bailey has a pretty interesting tale, too. While growing up in Oregon, he lived for stretches at a time in a white Suzuki Esteem with his mom, Debra Galban, who suffers from fibromyalgia and degenerative arthritis which made it difficult for her to work. His father wasn't in the picture. When he wasn't staying with one of his sisters, Bailey stretched out in the front seat, since the back of the car was crammed with their belongings. One of his mom's most prized possessions was an Olympic coin she found. Nothing elaborate, Bailey thinks it might have been from Dairy Queen, but it meant the world to her. That coin - with the Olympic rings carved on the back - became the embodiment of what her son could achieve. "She said all the time, 'You're going to be there one day,'" recounted Bailey, who's trying to get a passport for his mom so she can watch him race in London. "She always believed that." First, though, he had to get his act straightened out. And this was a big wake-up call: He was stabbed in the back and shoulder by a rival gang member in 2006. He was simply turning his back on an argument - trying to walk off the bus - when he was struck. Bailey was in the hospital for days, the knife just missing anything vital. Bailey was a bright kid who struggled to pay attention in class at Douglas McKay High School in Salem, Ore., in part because of attention deficit disorder. Instead, he played the role of class clown. After a brief expulsion his junior year, he began to see the light - school and sports were his way back on the right road. Getting out of gang life wasn't easy, though. He couldn't simply walk away, not without repercussions. Beaten up to get into the gang, he had to take a far worse one to get out. And then one day the pummeling arrived. Bailey was beaten so badly he had cuts over both eyes and his face was covered in blood. He trudged home and there, waiting for him, was his mom. They hugged and cried. Happy tears, because he was now free to start a new chapter, one that included buckling down in the classroom. He said he even received the turnaround student of the year award in the district his senior year. "To me, that award was a pretty big deal," he said. Given his size (6-foot-4, 180 pounds), Bailey was a natural on the football field and played several positions. Had his grades been better, he might have been looking at a football scholarship. Track didn't even enter the picture until his sophomore year. He was staring at the school's record board and boasting how he could easily break those marks. Walking by just then was John Parks, a former track coach at the school and the person who would serve as a father figure. Parks called Bailey on his bravado. "He said, 'If you're so bad, come out and join the team,'" Bailey said. "I was like, 'Yeah, whatever. I'll be there sometime.' I said that so he would leave me alone." Only Parks wouldn't let it go. Especially not after Bailey showed up on the track one day to run a lap before lifting weights. Unbeknownst to Bailey, Parks hit start on his stop watch to record the time. Bailey finished in 51 seconds. Not bad for hardly going all out. "He was smooth, like he was sliding on ice," said Parks, who oversees Bailey's training along with coach John Smith. Eventually, Parks got Bailey to come out for the team and envisioned turning him into a decathlete. That's because before world-record holder Usain Bolt came along, a sprinter that tall was hardly a common sight. Bailey's sprinting career got off to an inauspicious start. Running in his first meet and in spikes two sizes too small, Bailey broke his big toe, curtailing his season. After a solid high school career, he attended Rend Lake College in Illinois, winning a junior-college title in the 100 in 2009. That put him on the map in track circles, an up-and-comer to watch. Then came trials, when Bailey really burst on the scene. "I keep hearing all the time, 'I can't believe you made the team,'" said Bailey, whose son Tyree turns 3 in October. "I knew I was going to make it. I had no doubt."